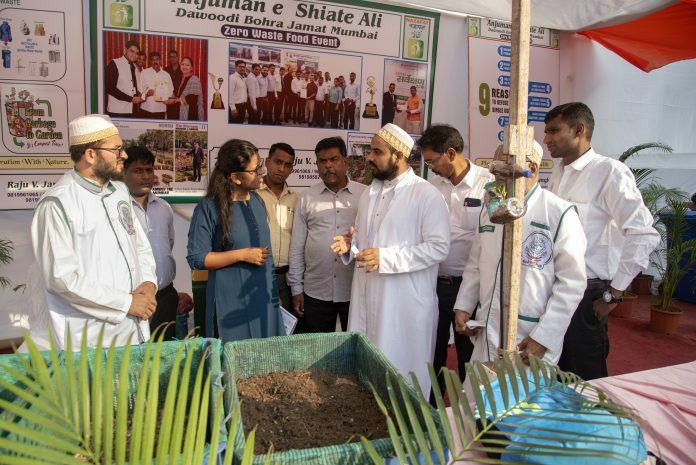 A three-day zero waste management event was held in the city in the weekend to mark the Urs (death anniversary) of Syedna Burhanuddin, the 52nd spiritual head of Dawoodi Bohras. Members of the community converted all the wet waste that they generated into manure using manual and automatic composting and the dry waste was passed on to recyclers. Around 60,000 people across the world attended the event. The organisers of the event generated around 1,000kg of wet waste and 200kg of dry waste during the event. The wet waste which was mostly from their kitchen had peels of vegetables, bones and leftover food while the dry waste consisted of plastic, cardboard, foil and paper. Zoeb Bootwala, a member of the Nazafat (cleanliness) team, said they expected six to seven tonnes of waste to be generated over five days from Eid Milad al-Nabi, which is the birthday of Prophet Mohammed, until the death anniversary of Syedna. But the waste received was much lesser. “The intention behind the event was to spread awareness and work towards making a positive change in society. The aim was to add another R to 3 R’s – Reuse, Reduce, Recycle and Rethink,” said Bootwala. Brihanmumbai Municipal Corporation (BMC) Ward officials commended the efforts taken by the community. “Their initiative is in line with the vision of the municipal commissioner, wherein bulk generators need to manage their waste themselves,” said Nitin Atre, assistant municipal commissioner. The members attending the event were asked not to waste food and the remaining food was distributed among slum dwellers. Swati Jangle, waste management head, RVJ Waste Management firm, Worli, who helped the community with the process said, “Almost 100% of wet waste and 90% of dry waste was processed at the source itself. Community members seem to be aware of the practices,” said Jangle.